Git repositories became an integral part of the development process, and usually they are administered with GitHub or BitBucket. But while having a private project you may not want to trust the code to the tool hosted by a third party. So in order to get the required control, flexibility and simplicity within own dedicated server, developers turn to GitLab installation. Professing an open source business model, a dedicated GitLab server can be easily deployed to a cloud environment. And the deployment with the help of Docker containers allows to immensely increase elasticity and scaling for extra efficiency. 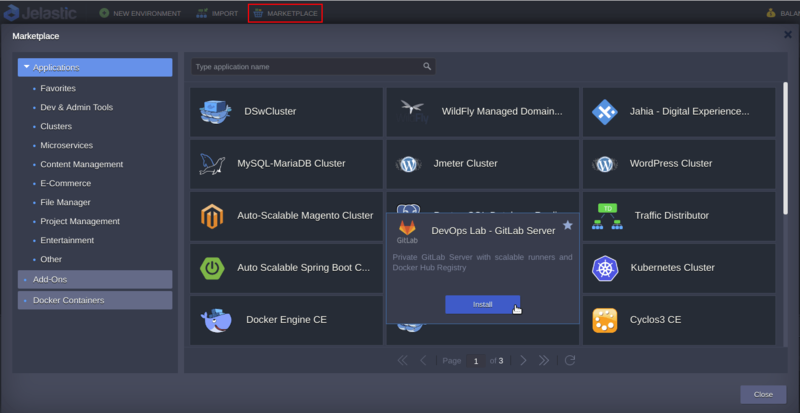 In this article, we will demonstrate how to combine cutting-edge technologies such as GitLab and Docker using Jelastic PaaS automation functionality. We found a popular repository sameersbn/docker-gitlab with detailed multipage manual how to get running a private GitLab Server in containers. This project is licensed under MIT and distinguished by a high rate and numerous forks that proves its sustainability. Let’s walk through the installation process. 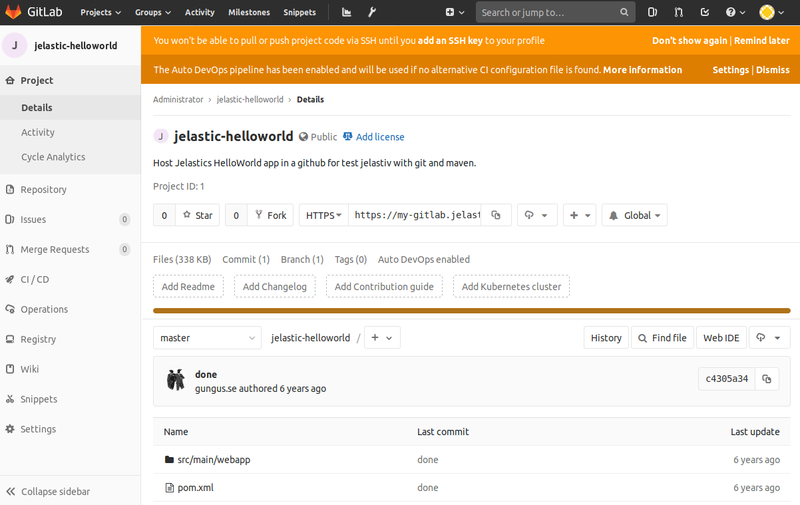 Enter Jelastic dashboard, find GitLab in the Marketplace and press Install. Alternatively, you can import the DevOps Lab manifest pressing Import button. In the opened popup dialog, specify the Name of Environment and choose the preferred Region. Click on the Install button. Wait a few minutes till installation is completed. Using credentials from the successful installation message or received email notification, log in to admin panel by pressing Open in Browser. When a team is growing and private GitLab Server becomes busy with builds of many different projects, it’s time to consider the increasing number of Runners to build and deploy. 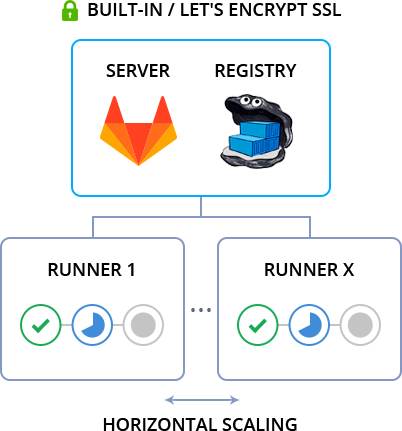 The package automation helps to get benefits of horizontal scaling without the need to perform any extra manual configuration. 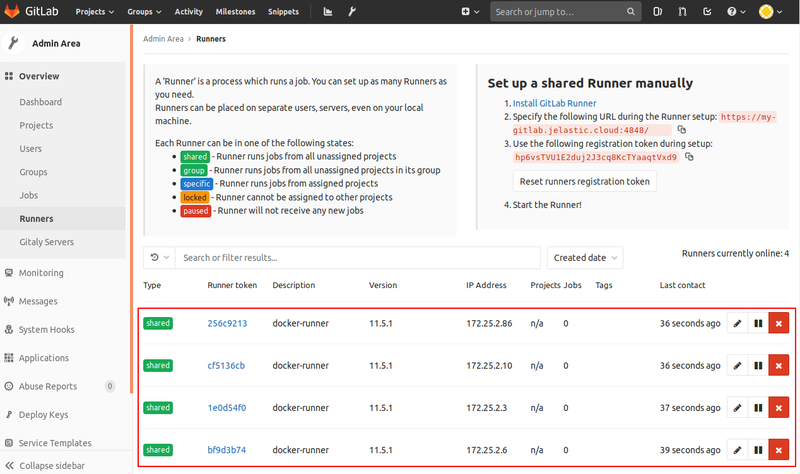 Each Runner is going to be placed in a separate container and automatically registered to Git server. 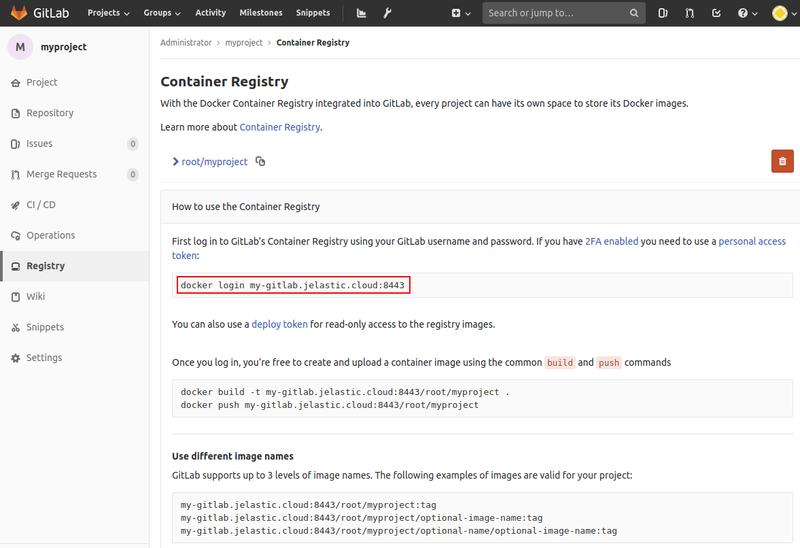 First of all, let’s make sure that the initial GitLab Runner instance is properly registered at Git server. Open Admin area > Runners. 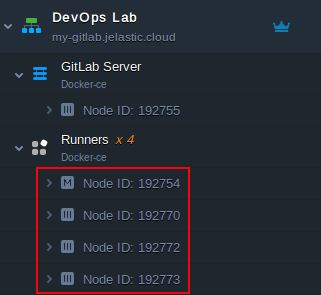 And to get more Runners, go to Jelastic dashboard and press Change Environment Topology button. 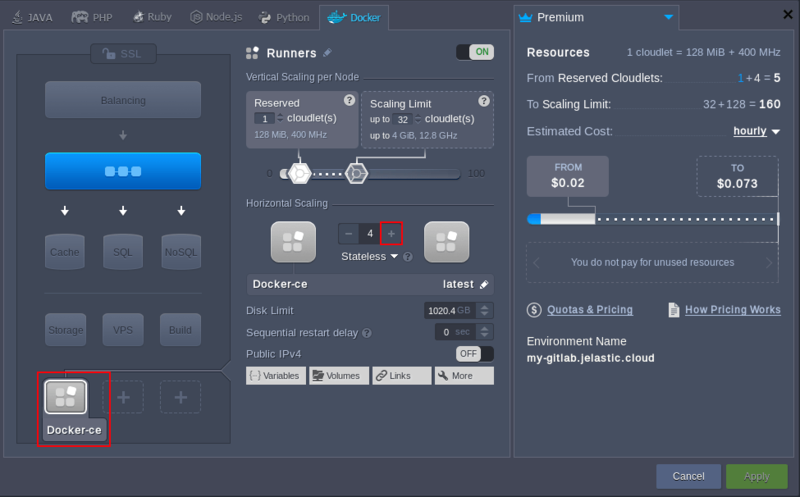 Then click on Docker-ce icon and press + button in Horizontal Scaling section to add more Runner nodes. Finally, Apply changes. Now, we have four Runner instances. Using GitLab Admin Area, make sure the new instances are registered at your Git server. 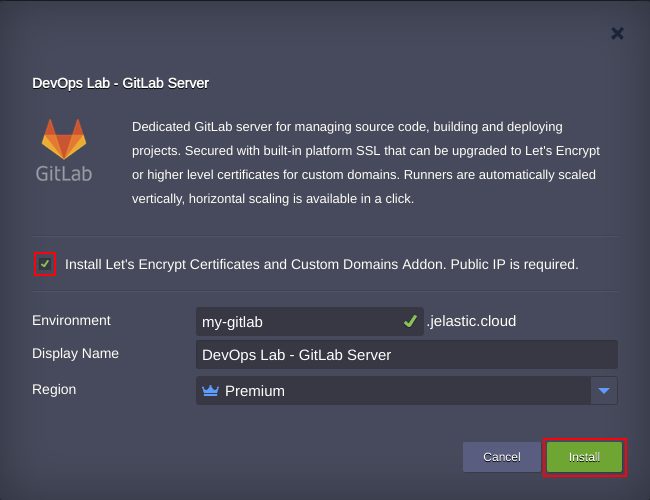 Let’s briefly review how to import projects from GitHub to our private GitLab Server hosted in Jelastic PaaS. Once you logged in to GitLab Server admin panel under account which was automatically created for you, сlick on Create a project. Then press Import project and after that click-on GitHub. 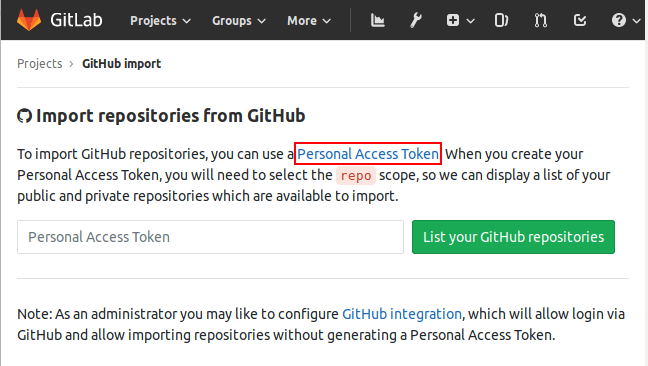 To import repositories, you have to get a Personal Access Token. 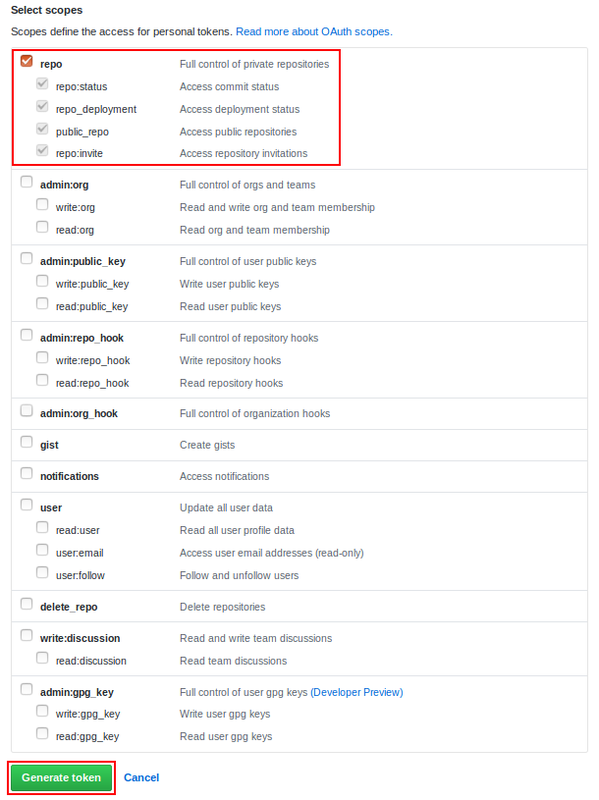 Choose the required scopes (at least, repo section to be able to manage repositories). Finally, press Generate token. Copy the token, get back to Import Repositories from GitHub, paste it in a proper field and submit by clicking the button. Now you have an access to your repositories at GitHub. To begin importing, you should click on the corresponding Import button next to the required repository. 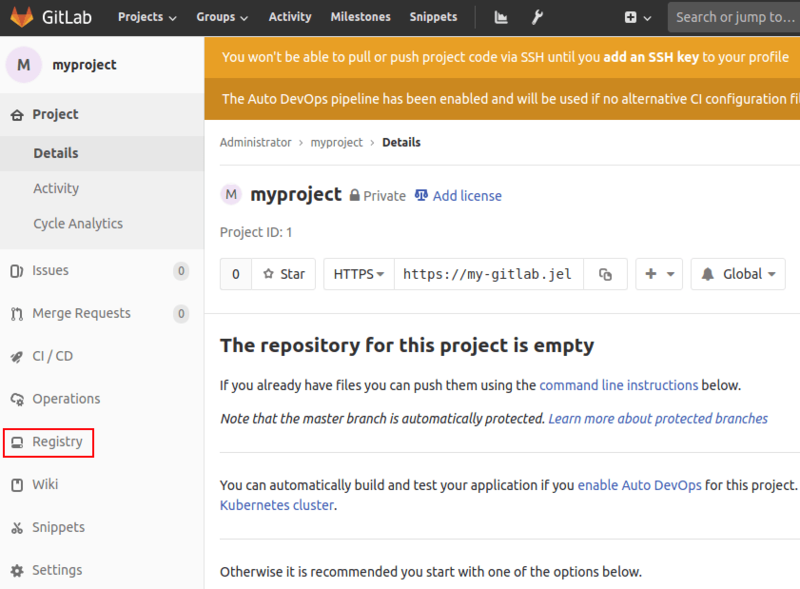 Importing is finished, the project was delivered to the local GitLab platform. As it was mentioned, the package provides Private Docker Registry. To connect to it, use details that can be found by Create a project > Registry. So, click on Create a project. Fill out the project name (e.g. myproject) and create it. Then click on Registry icon in the left pane. After that, you’ll be redirected to your private Docker Container Registry page. Take the connection string to ensure the Registry is accessible. Installation window has an option to install Let’s Encrypt add-on that will provide an ability to generate an SSL certificate for a custom domain which is bound to your environment. In this case, the environment will be created with attached public IP and Let’s Encrypt staging certificate by default. To install a fully trusted production certificate, you have to bind a custom domain to the GitLab Server via A or CNAME records beforehand. For this, open Add-ons settings. 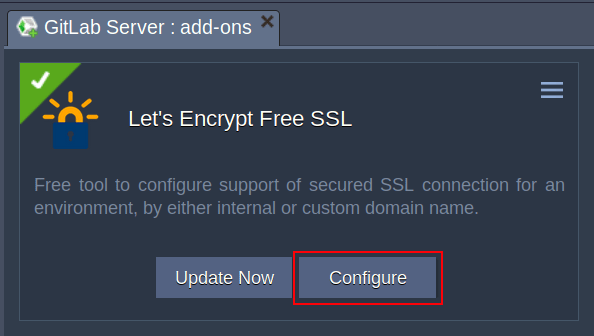 Find Let’s Encrypt Free SSL add-on and click on Configure. After that, specify the custom domain name e.g. gitlab.extdomain.com in the External Domain(s) field and press Apply. 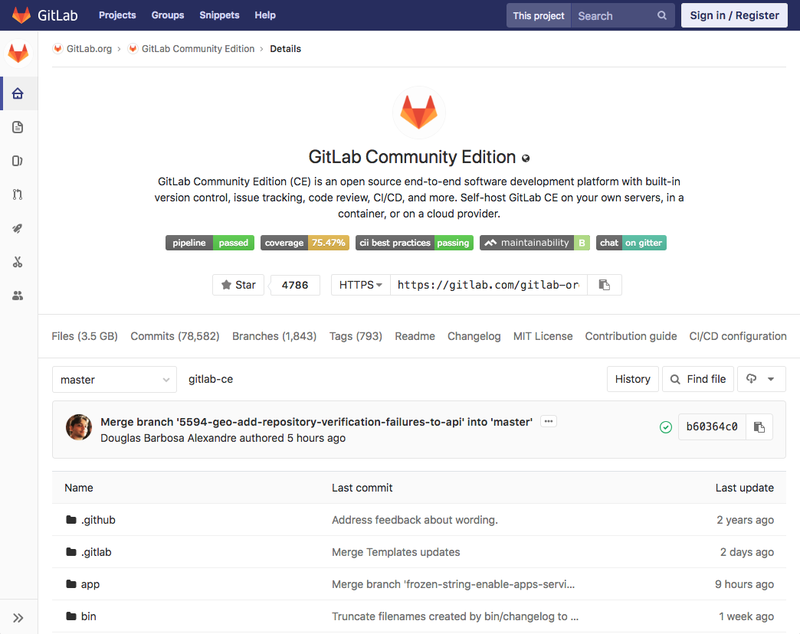 The package has a built-in GitLab Server software update procedure that can be initiated via Update GitLab Server add-on, which comes installed by default. Update procedure checks whether new version of GitLab server is available at Jelastic repository and updates it if any. 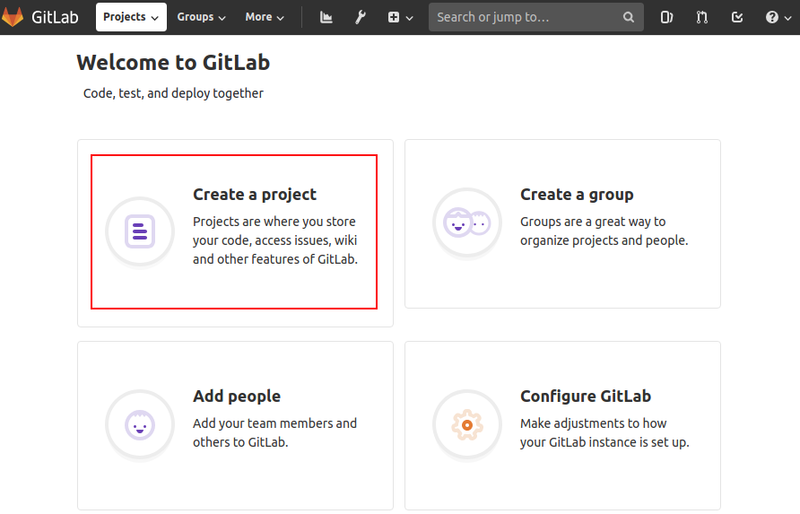 To do this go to Add-Ons as described in the previous step, find the Update GitLab Server add-on and just click on the Update button. That’s it! 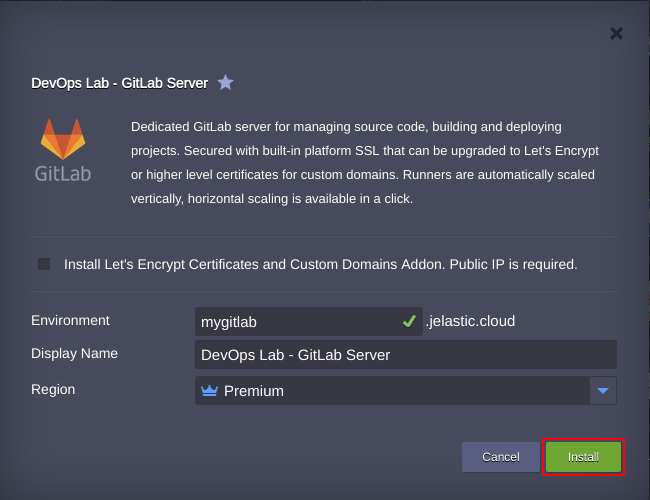 Gain the required level of control, flexibility and simplicity while managing your code in a dedicated GitLab server. Give a try within Jelastic PaaS and share your experience.